If you need to store some of your belongings, it’s important to store them in appropriate containers to keep them safe and in good condition while you’re not using them. Check out these different options for storage and decide which container is right for you. Whether you’re downsizing your home, leaving the country for a few months, moving out on your own for the first time, or just trying to declutter your home, Just Store It! 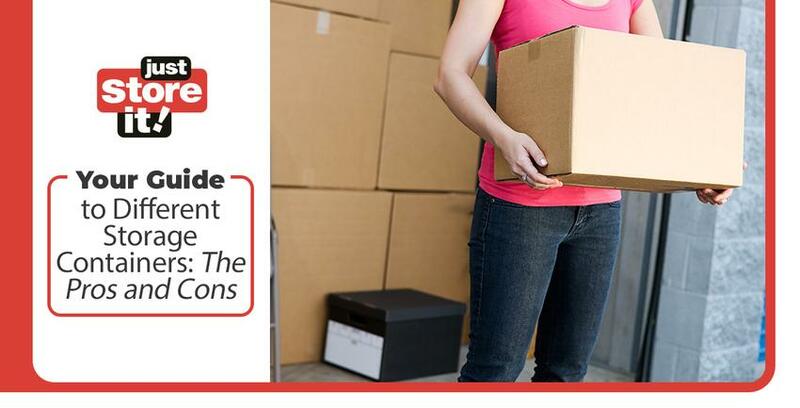 has a variety of storage units available for you to store your belongings. If you need to store some (or all) of your belongings, contact us today for information about our available storage units. Many people’s go-to for storage containers is the classic cardboard box. They’re easy to find at hardware stores in a variety of sizes. Many have categories printed on the outside, which makes it easier for you to label. Cardboard boxes are corrugated too, meaning that they have an extra layer that provides a little cushion for the items that you’re storing inside them. Many cardboard boxes also have handles cut out, making them easier to carry. Cardboard boxes are also lightweight, preventing a lot of additional struggle when you plan on packing and carrying heavier items. Cardboard is also more affordable than a lot of other containers. Cardboard boxes also hold up well in climate-controlled storage units. These types of storage units will keep cardboard boxes cool and dry. At Just Store It!, we have a variety of storage units that are climate controlled, so you know your items are kept in good condition whether you leave them for a few weeks or a few years. Unfortunately, when cardboard boxes are stored in places that aren’t kept cool and dry, they can absorb moisture and become soggy. The items inside of your cardboard boxes will also start to absorb this moisture, creating water stains and potentially ruining your belongings. Stacking can also be an issue for cardboard boxes. When handled regularly, cardboard will start to crease and break down. If you’re going through your storage regularly for holiday decor or seasonal clothing, your unstacking and restacking of boxes can cause this breakdown and you won’t be able to stack everything back as neatly or safely. This puts your belongings at risk to be damaged. If you’re storing items short-term or in a climate-controlled storage unit, cardboard may be okay. You will probably be better off using cardboard for moving, though, and finding a better option for storage containers. It may be surprising that plastic bags would be considered an appropriate storage container for anything, but there are a few items that can be stored safely in plastic bags. You should also use a product like DampRid or another moisture absorber in any plastic bag you’re storing things in, though. The best items to store in plastic bags are things that are light and durable. You can easily store things like pillows in a large garbage bag without fear of them being damaged. Sturdy plastic toys are also a good option to store in plastic bags. Remember not to seal the bag entirely in order to let your belongings breathe still. Plastic bags have very little structure and are not very sturdy. Even super-duty garbage bags can rip if packed too full or with items that have sharp corners. Plastic bags don’t stack very well and any pile can easily topple over if items shift at all. There are so few items that can be stored safely in plastic bags anyway that you would be better off finding a different type of container that will work for all of the belongings you’re putting in a storage unit. Whether for short-term or long-term storage, your best option for storage containers is plastic containers. They’re much sturdier than cardboard boxes and can be reused regularly without breaking. They also stack really well; most have grooves on the bottom and on the lids so they fit together. Plastic container seal well and keep things dry. Plastic containers are also available in a variety of colors and sizes. Clear containers make it easy to see what’s inside, while colored containers are good for color-coding and protecting items from fading, like clothes or artwork. Plastic containers also have fitted lids. Instead of trying to tape a box closed with packing tape that you’ll eventually have to peel off, why not just use a plastic container with a lid that snaps on perfectly and comes off just as easily? It makes safely storing and accessing your items more convenient. Handles are also a handy feature on most plastic containers. It can be hard to get a grip on a box that doesn’t have any handles, especially if the box is heavy. Handles make plastic containers easier to, well, handle. Whether it’s a container of textbooks from college or your scarves from winter, you can move and reorganize your plastic containers more easily when they’re easier to hold. The main drawback to plastic containers is the price. They are definitely more of an investment than cardboard, but they will also last you a lot longer. Take inventory of everything you need to store and only purchase the amount of plastic containers you need. If you’re in need of a storage unit in Elizabethton, don’t trust just anyone with your belongings. At Just Store It!, we’re committed to clean, secure, and convenient storage. Contact us today if you’re interested.